This year for Valentine’s Day weekend, Executive Chef Orlando Rodriguez and Sous Chef Sarah Hassler are trying something a little different at Veraisons – a unique Chef’s Tasting Menu coined “Love is Blind” which will take our guests on a journey of the senses as each of the five courses will first be sampled blindfolded. Read on for Chef Hassler’s Top Ten Reasons you should be excited about this menu! 1. You’re not blindfolded the entire time. This is not dinner in a dark room, where we ask you to fumble your way through course after course. Instead, upon choosing the Chef’s Tasting Menu, you will be given a satin sleep mask. The server will let you know when the next course is ready to arrive, signaling you to put on your blindfold. Each course will arrive first as an “all-in-one-bite” taste and will be served on a spoon. The wine will be served at the same time and your server will be sure you have both spoon and wine in hand before stepping away to let you enjoy the tasting experience. Once you have completed the blind-taste, the full plated course will be delivered – no blindfold needed. 2. Appreciate how beautiful the plates look. We simply couldn’t write a menu without making the plates look pretty in our minds. Orlando especially is a major proponent for color; it is incredibly important that the courses be colorful and vibrant to him. In our ping-pong style menu-writing session, we couldn’t help but discuss how we would plate the components, how the finished courses would look. Even though neither of us could draw a stick figure properly, we even sketched our ideas out to convey to one another. It was then we decided to offer a simple spoon for the blind-taste, and a second full plated course that could be enjoyed with the eyes as well. 3. Wine Pairings – Wait, I could have sworn that white was a red! Maybe you’re not as food savvy as you’d like to be, but when it comes to wine, you’re the expert in your circle. The wines that have been paired with each course are also meant to be tasted blindly, and should offer yet one more layer of intrigue to the meal. 4. Blindfold optional, but either way you could truly leave your evening up to the chefs. We get calls from time to time from folks who would like to come and enjoy a meal at our restaurant without the menu. They request a special dinner and leave the ingredients and plates up to us. I can honestly say that we haven’t had a single unhappy customer who did this. We realize this is an exercise in trust. When we wrote the tasting menu we tried to focus on flavors and textures that would meld beautifully together, and also represent who we are as chefs. More importantly, we chose foods we think are delicious and would be excited to eat were we sitting at the table. You define the level of “blind” – whether it means dining without knowing the menu or going all-in with a mask. 5. You might find something you didn’t know you liked. I can’t tell you the number of times someone has told me they don’t like kale, only for me to cook it for them and have them exclaim that they love it! I think it was Jeffrey Steingarten, author of “The Man Who Ate Everything” and big-time food critic, who said “in order to determine whether or not you really like something, you must taste it ten times, cooked ten different ways”. 6. Excellent practice for those interested in Hell’s Kitchen Blind Taste Challenge! You know you laughed at the guy who couldn’t tell the difference between a beet and a potato. Now put yourself to the test just for the fun of it! It may sound cliché these days, but it is true. When you have one less sense to rely upon, the others scurry to make up for the difference. We encourage you to take your time with your tasting, use your sense of smell as much as possible. In both wines and in food, aroma compounds can be deceptive and telling, sometimes both at once! 8. You might leave with a little more love for food. My partner insists upon being able to see while he eats. He is an incredibly early-riser and is kind enough to remain quiet and keep the house fairly dark while his chef-girlfriend sleeps in until around nine each day. He swears that eating in the dark makes the food taste “less” somehow; that he doesn’t appreciate broccoli unless he sees that beautiful bright green pigment. Perhaps this is the case for you as well….if so, upon removing your blindfold you may find that you appreciate being able to see your plate even more than you normally would. 9. You’ll have an excellent story to tell! This dinner is meant to be fun, maybe slightly educational, and engaging. No matter the level of interaction you choose, you will no doubt leave the table with a memorable tale to recount to friends and family. Because…..
10. This isn’t just another meal. We wanted to create an experience for our guests. Something to make your Valentine’s Day one to remember. We hope you will join us! The “Love is Blind” Tasting Menu is available for dinner February 13-15th at Veraisons Restaurant. $60 per person or $75 with wine pairings, plus tax & gratuity. Reservations can be made by calling 800.243.5513. Veraisons’ daily dinner menu will be available as well. Check our Valentine’s Day lunch special as well by clicking here! 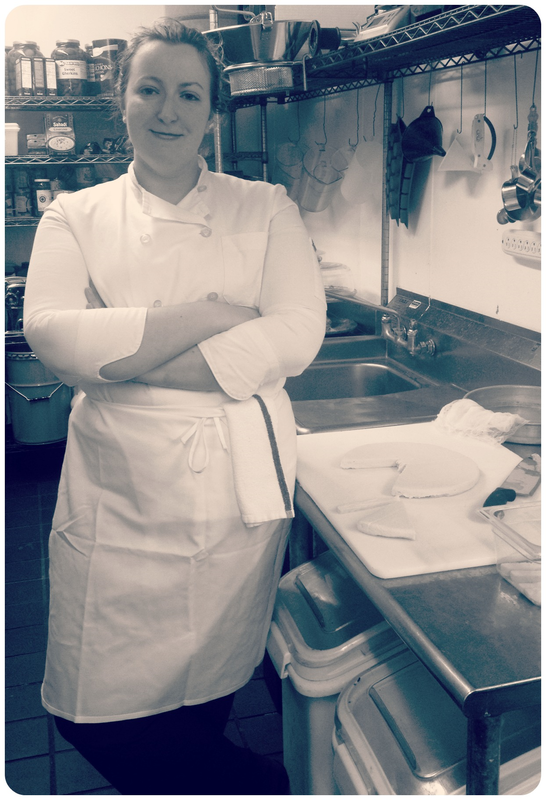 Author Bio: Sarah Hassler is the Sous Chef of Veraisons Restaurant. A graduate of the Culinary Institute of America and a native of the Finger Lakes region, Chef Hassler has a keen understanding of flavor and nuance and a reverence for the agricultural community, bringing local ingredients into her cooking as much as possible. She has been a member of the Glenora team, in between her time at CIA and professional experiences in the Hudson Valley and Corning, since 2009.